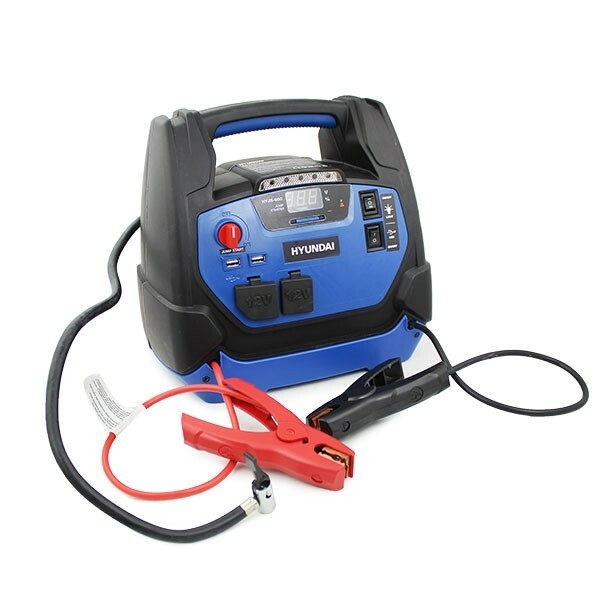 The HYJS-950 is a 12v jump starter with 150 PSI air compressor from Hyundai. Equipped with LED flashlight, USB power output, 12VDC power output and air compressor enabling you to inflate your vehicle tyres in an emergency and for regular tyre maintenance. The HYJS-950 is a 12Ah professional grade jump starter for vehicles up to 2.5ltr petrol and 2.0ltr diesel. This unit is a power source for all 12DC devices that are equipped with a 12V accessory plug, ideal for use with in car phone chargers, car vacuum cleaners, work lamps and much more. In the box: HYJS-950, user manual, inflation adapters and cable clamps.